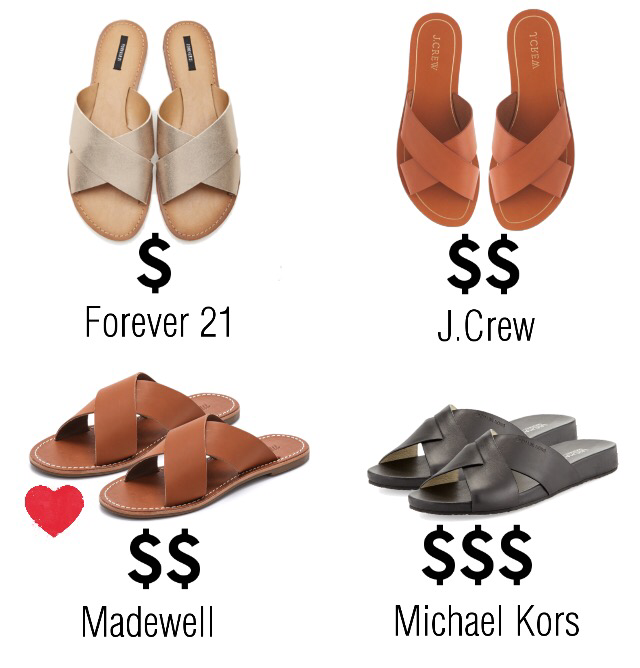 I’m drawn to sandals with the criss-cross front; I have quite a bit of them. So when this style started cropping up at retailers this Spring and Summer in several variations, materials and price points, I was excited. Thought I’d share a few of the options out there that I’ve personally seen, tried on and/or purchased. Out of the four pictured here, the one I like the most based on comfort, material and price is the Madewell version. Here is a list of my thoughts on each and why the Madewell version is my favorite. Forever 21 ($18) – this is (you guessed it) the most affordable of the four. I tried this on in store and expectedly, it doesn’t have much support but for the price, it’s not that bad. It runs true to size for me; I usually wear a 6 and they fit perfectly. In store, they had the usual neutral and metallic colors. 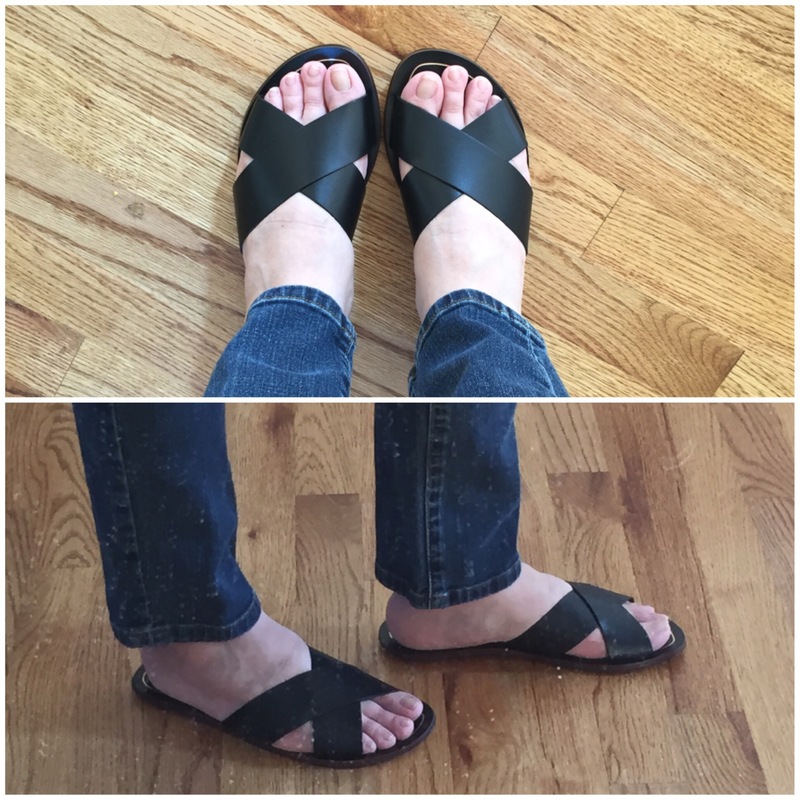 Online, they have many versions of this sandal, see here. J.Crew Cyprus (online currently $39 to $78 depending on color online, in store $60 + additional 50% off) – this is the prettiest of the four and of course the material is as expected for J.Crew leather shoes. It’s got a pristine, shiny look to the leather. However, much like their Capri thong sandals, the foot bed is horrible. No support and so hard; I believe the bed is made of wood with a leather cover. It also runs small; I normally wear a 6 but had to go up to a 7 in these. I own it in black; although I know I won’t wear this for a day of walking, it’s a nice option for a quick day/night out. 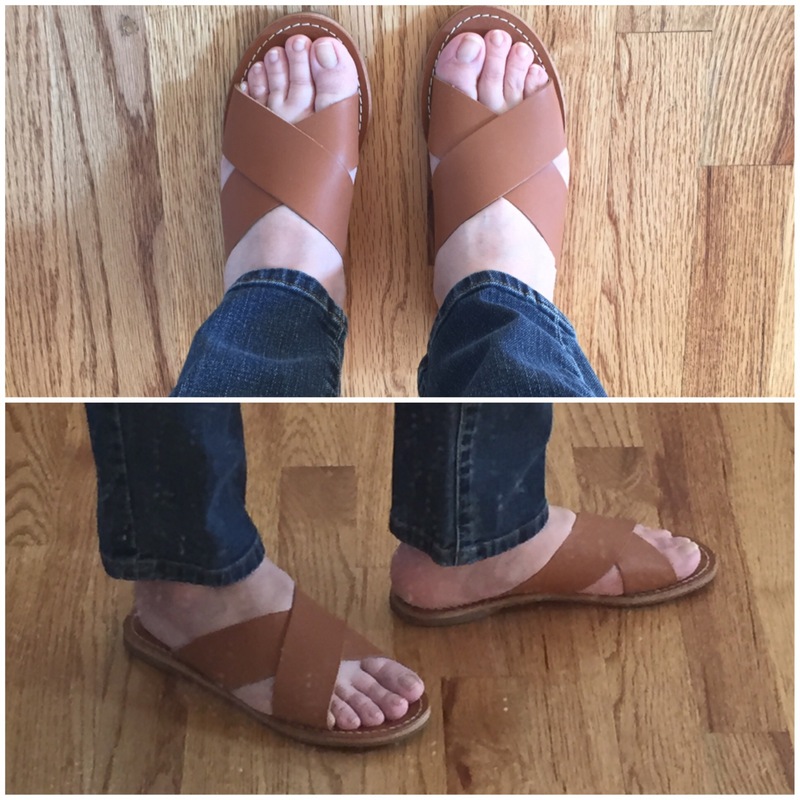 Madewell Sightseer Slide (online $60, last time I checked same in store) – this is my favorite of the four for the price. The foot bed is comfy, all leather. It has a more matted look to it than the J.Crew version, much like their leather bags. It also runs small like the Cyprus; I got it in a 6 but should’ve sized up to 6.5 or even a 7. The criss-cross has a lot of give though; I think because the leather is softer, it may stretch out a bit so I’m ok with it. Michael Kors Somerly Slides (at Macy’s, all shoes are buy 1 get one half off, see here or at Cusp.com for $69) – if I had my pick regardless of price, this would actually be my choice. It has the most support and the criss-cross part is comfy; the material is great, plus it’s true to size. I tried this on at Macy’s and almost picked it up but it was regular priced then. I may go back for it in July [note: I’m on a no-buy June 😦 ]. Overall, I’m happy with my purchases from May (Madewell and J.Crew); I have one for comfort and another for looks. If you’re interested in trying this style out for the warmer months or if you lucky enough to wear this style year-round, check these affordable options out. That’s it for now!